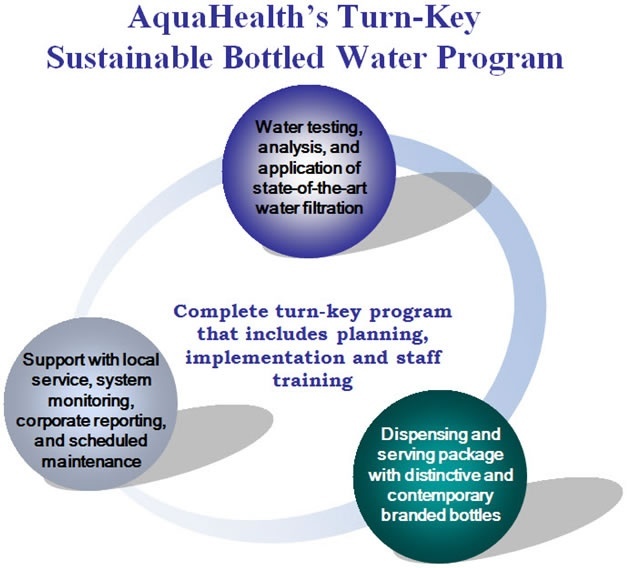 AquaHealth demonstrates a commitment to finding your custom Sustainable Bottled Water Solution. We offer a complete Turn-Key program, which includes planning, implementation and staff training. We test your water and fit our state-of the-art purification component to each specific application; be it a restaurant, banquet space, in-room dining, or other venue. We provide the dispensing options, ensuring that the unit fits the space and the volume considerations. Glassware brand, size, type, and amount are chosen and provided in a timely fashion. We have an army of over 85 trained service organizations that work every day to ensure that our customers are taken care of. System monitoring, routine and unscheduled services, as well as follow up trainings are always provided in a timely manner. We have the most highly trained, experienced and motivated customer service and field service support teams in the industry to ensure that you are fully satisfied.